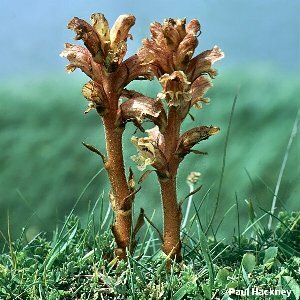 This plant is parasitic on wild thyme and is a bright red colour throughout (it is often called the red broomrape). It grows along the basalt scarp of Co. Antrim, on sand dunes and wherever else wild thyme occurs. The notable Belfast botanist John Templeton was the first to discover this species in the British Isles when he found it on Cave Hill towards the end of the eighteenth century. It still grows on Cave Hill. All names: Orobanche alba Stephan ex Willd. 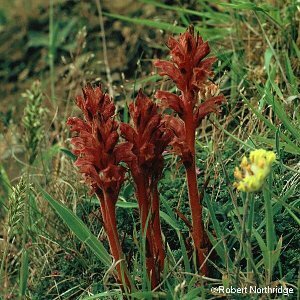 ; Orobanche rubra Sm.